add lots of fun to the birthday celebration! What other time would someone (in their right mind) wear this?? 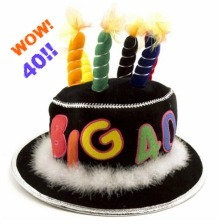 Here are my top funny 40th birthday ideas. Turning 40 triggers a mid-life crisis for some. And this can give you some really funny gift ideas. Remember - a midlife crisis applies to both men and women! These custom cheap Tshirts are perfect for a 40th present! is a silly 40th birthday gift. a stupid bumper sticker like this one! a small piece of rug tagged "hair piece"
Here are some other great gifts to add. You can also add. . .
~ a few chocolate bars labeled "emergency rations". ~ Of course she'll need fake tattoos. . . these are so funny! And if you want to take the gift even farther . . . here are some great ones! I was so surprised to find these super silly gifts! These t-shirts will be the life of the party! You can also make your own tshirt and totally personalize it. Throw an over the hill surprise birthday party with black balloons, black cake (very dark chocolate), play some somber music. Have everyone dress in black. Here are some great over the hill gifts...another great find! And if you can't be at the party - send this great over the hill birthday cake! What a great 40th birthday gag gift! If the birthday boy or girl is fun-loving . . . instead of a "wedding dance" where people stuff money in the bride's dress. Have an "over the hill dance". Guests still stuff money, but it's for funny things like . . . plastic surgery, a trip alone on a dessert island, etc. Clue the party guests in before-hand so they'll be ready for the fun! This is a great 40th birthday gag gift! A "Find Oneself Box" is my favorite! Have a black box containing a small dictionary, a magnifying glass, a map, a phone book, a compass, a small globe or map of the galaxy, a sack of marbles with a note on the bag that a few are missing. You can customize a 40th birthday card!